Pupils from schools in Worcestershire and Gloucestershire recently received an insight into the many career opportunities in agriculture and horticulture at an industry open day hosted by Pershore College. The event on 7 June, provided Year 9 pupils from Trinity High, Redditch and Winchcombe School, Cheltenham with a better understanding of how this innovative sector is meeting the challenges of food and plant production with the latest agricultural technologies. The day, which was organised by WCG Worcestershire and the Worcestershire Local Enterprise Partnership, consisted of industry talks, careers advice and a tour around the college’s extensive facilities to see a number of engaging demonstrations. These included arboriculture, agri-tech, animal science and the use of drones in orchard management. A delegation from the Department for Environment, Food and Rural Affairs (Defra) was also in attendance. Professor Roy Kennedy, leader of the agri-tech programme at Pershore College, led students and guests around the dedicated agri-tech laboratories which house the electronic, robotic and computer-based technologies that are used to educate students on the modern applications of agri-tech. Visitors and students also viewed the live field-based experimentation and demonstration facility that enables the college, local horticultural businesses and students to work together on solving industry challenges through pioneering research trials. One of the industry speakers was Bal Padda, Commercial Director of Vicarage Nurseries, a family-owned soft fruit grower situated in the Vale of Evesham. The award-winning business is currently working with the college on hydroponic strawberry production. Bal, who brought in fresh strawberries for a taster session, said: “It was a pleasure to be invited to the industry day at Pershore College as it is essential to encourage the next generation to look into careers in horticulture and agri-tech. Neil Coker, Group Vice Principal, WCG Worcestershire, said: “WCG has worked in partnership with Worcestershire LEP, Agriculture and Horticultural Development Board and local employers to highlight the wide range of career opportunities in food production, processing, manufacturing and retail. Our industry day was a fantastic opportunity for local school pupils to understand more about this innovative sector, hear from experts and get hands-on with some of the technology we have at the college. “Our LEP-funded agri-tech centre is at the forefront of land-based education and training in the region, with the Level 3 Extended Diploma in Agri-technology (Food Production and Plant Science) providing a superb option for post-16 learning. This qualification also makes an excellent platform for entry into degree level study or employment. Pershore College offers a wide range of horticulture courses including apprenticeships, full and part-time courses and degrees. For more information, visit the WCG website or call 0300 456 0049. 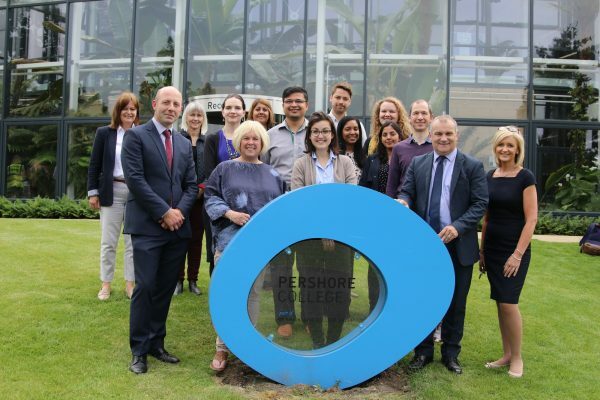 Pictured: Individuals from Defra, Warwickshire College Group and the Worcestershire LEP outside Pershore College.